In his treatise On the Soul Aristotle creates, in reference to visibility, a very concrete conception about the light and the diaphanous. So, he suggests that in order to see we need a continuous series of diaphanous means. 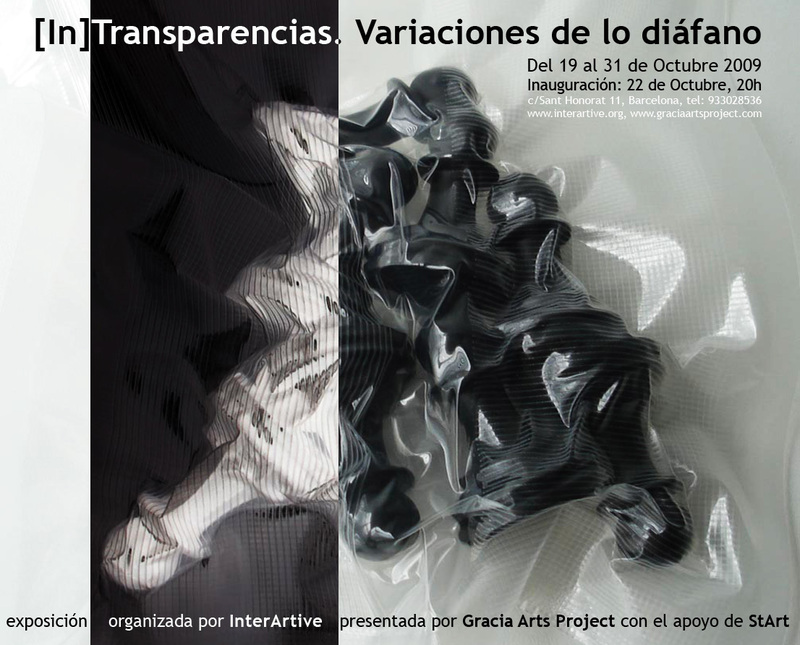 The works presented in the exhibition [In]Transparencies. Variations of the diaphanous evoke, each one of them in its own language, shades that flow within the limits of this concept of the diaphanous. The selected works suggest a fragile time, memories and images that overcome a diffuse luminosity, posed as a game of transparencies and opacities. Lela Martorano, in her photographs from her series Dazzle projects an image taken from a family archive onto old postcards from the city of Granada. In this fusion, the images sink into colors and shadows, impose memories into one and only photograph. In Vacuums by Cláudio Trindade, the function of the objects is canceled, making this ambiguous attitude of protection and annihilation visible. The transparency of the material that wraps them doesn't just reveal, but it also hides -by making every object useless. Roberto Freitas in his Whispers installation oscillates between science and art. He constructs a mechanism, a machine, an ingenious apparatus capable of projecting the subtle activity of wind, or to be exact, of breeze. That way, through a game with light, the incorporeal makes itself visible and converts itself into image. In the installation Solar Eclipse, Haris Pallas suggests, by means of projected shadows, a presence. Vaporized, his images appear and disappear, produce a hidden sense of shape of a body in motion, a body that stays suspended in its own shadow. That way, throughout the route, the look glides among works that, aligned by the Greek concept of the diaphanous, permeate subtleties and bring to our eyes planes of light and poetics of the transparency/in-transparency.